Distracted drivers were responsible for the deaths of 3,450 people on U.S. highways in 2016, according the the National Highway Traffic Safety Administration. Distracted driving is an issue that hits close to home for Chris Outen of FedEx Freight. When Outen was just 12 years old, he lost his father to a car accident. Now 56, Outen preaches safe driving every day whether he’s on the road, advocating for the industry as an America’s Road Team captain, or competing at a truck driving championship. 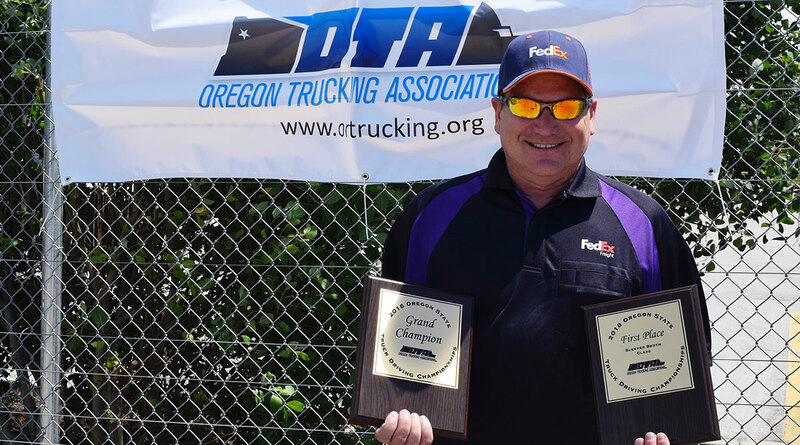 He’ll be taking that message to the national stage for the ninth time after winning the sleeper berth class and Grand Champion honors at the Oregon Truck Driving Championships on June 16. Outen’s goal for the Oregon championships is to earn a first place in all nine of the classes at state, and he is almost there with victories over the years in Straight Truck, 3-axle, 4-axle, Twins, Tank Truck and Sleeper Berth. Outen also has been named Grand Champion twice before, 2011 and 2017. In 31 years of driving, Outen has racked up 1.6 million safety miles and is proud to have become an America’s Road Team Captain. While Outen is an accomplished truck driver, he initially had no interest in the profession. For five years, Outen had worked his way up to assistant manager at a grocery store. However, after losing his job, Outen entered another field that led him to the trucking industry. “At the time I lived in Boise, Idaho, I just needed a job and my brother worked in the trucking industry. He worked for Viking Freight, so he said ironic enough I can get you a job working on the dock if you want to. I said that’s fine but there is no way I’d become a truck driver. But I absolutely fell in love with it and here I am over 30 years loving every single day of it,” Outen said. Despite his initial hesitance to go into trucking, Outen still held a high appreciation for truck drivers. Outen clearly remembers his first solo trip from Boise toward Twin Falls on Interstate 84. Since that first trip, Outen’s love for trucking has only grown, and he can’t imagine going back to the grocery business. “The one great thing about trucking is I never have to look at the clock really. Every day seems like it is 2-3 hours long. As soon as I start, I’m out there making my deliveries to my customers and making my pickup. Then it is time for lunch and then it’s the end of the day,” Outen said. Over his career, Outen has learned one valuable lesson. “One of the most important things I’ve learned in my 30-plus years is to be a defensive driver, which means I don’t make any mistakes — well, I overcome the mistakes of others. In this day and age, our roads are so congested and we have so many distracted drivers out there who are on their cell phones, eating, putting on makeup and everything,” Outen said. Even before becoming a truck driver, road safety always had been an issue that was close to Outen’s heart. Outen was just 12 when his father was killed and his mother had to take care of him and his two brothers. The sudden loss changed his family, and it also changed the way Outen sees driving. In 2017, Outen became an America’s Road Team Captain, where he has been able to further push the importance of road safety. Through outreach programs such as Share the Road and Touch a Truck events, Outen demonstrates the importance of safety and shares his story about his dad to kids and teens.